In a pan add oil and splutter mustard seeds. Add curry leaves, dried chilies. To this add bitter guard, green chilies, turmeric powder, salt and water. Close the lid and cook. When it is half cooked, add onion. 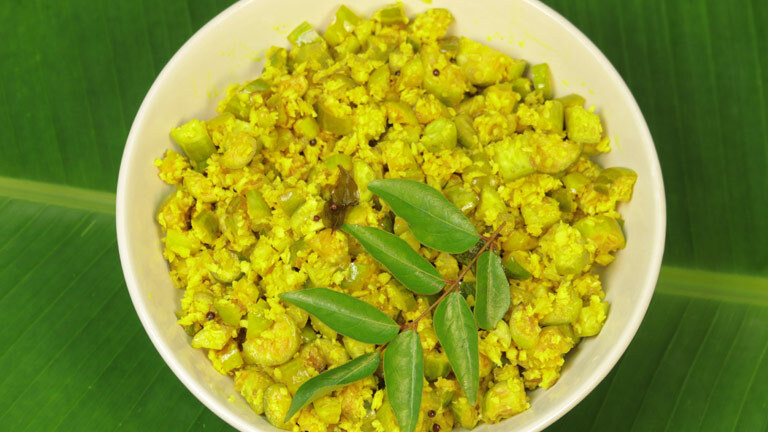 After 5 minutes add coarsely ground mix of coconut, cumin seeds, garlic and curry leaves. Mix and close the lid and let it cook till the thoran becomes dry.